Medi-First Instant Hot Pack - 1 Count. Perfect for any first aid kit, these disposable hot packs are convenient and simple to use. Keep 1 or more always available for those minor medical emergencies. 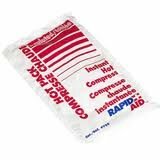 Medi-First Instant Hot Pack - 1 Count. Perfect for you first aid kit. These hot packs are disposable and simple to use.